The exercise effects on behavioral tests, hippocampal and cortical oxidative stress, and hippocampal inflammatory cytokines of lipopolysaccharide (LPS) administered rats were investigated. The rats were divided into four groups (N = 8): (1) control; (2) moderate training (MT, 15 m/min, 30 min/day, 9 weeks); (3) LPS (1 mg/kg LPS) and (4) LPS + MT (1 mg/kg LPS; 15 m/min, 30 min/day, 9 weeks). LPS was injected 2 h before the behavioral experiments during the last week of training. Finally, the rats’ brain were removed for biochemical assessments. LPS increased escape latency and traveled distance to reach the platform in Morris water maze (MWM) test (P < 0.05–P < 0.001). In the passive avoidance (PA) test, LPS decreased the latency to enter the dark compartment and the time spent in the light compartment and increased the time spent in the dark compartment (P < 0.01–P < 0.001), while MT improved the rats performances in MWM and PA tests (P < 0.01–P < 0.001). 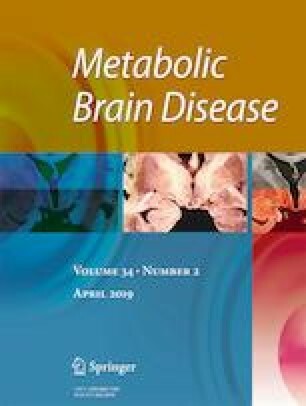 Additionally, LPS increased tumor necrosis factor α (TNF-α), interleukin 1 beta (IL-1β) and C-reactive protein levels in the hippocampal tissues, malondialdehyde (MDA) and nitric oxide metabolite in hippocampal and cortical tissues, and decreased thiol contents and catalase (CAT) and superoxide dismutase (SOD) activity in hippocampal and cortical tissues compared to the control group (P < 0.01-P < 0.001); while moderate training decreased the levels of TNF-α, IL-1β and MDA; increased thiol contents, and SOD and CAT activity in the LPS + MT compared to the LPS group (P < 0.001). These results indicated that moderate training improved LPS-induced learning and memory impairments by attenuating the hippocampal cytokine levels and brain oxidative damage. The results described in this paper are part of M.Sc. student’s thesis. The authors would like to thank the Vice Presidency of Research of Mashhad University of Medical Sciences for financial support. The authors declare no conflicts of interests in this study.